Your pool can be a fun and refreshing place to spend your summer hours, but it doesn’t have to be limited to just swim time. With a little extra effort and attention to detail you can amp up the atmosphere to a whole new level, and make your pool area a truly welcoming retreat. Here are ten things you can do to liven up the pool area. While there are certain restrictions to what you might want to plant near your pool, such as limiting the amount of leaves and debris that will end up in the pool itself, that certainly doesn’t mean you shouldn’t landscape the area. You’ll want to choose plants that are hardy and can withstand the humid atmosphere and any potential chemically treated water. Large planters for some bold color options can make your space much more inviting. If you are looking for a tropical vibe, try banana trees (placed near a wall is best for protection from strong winds), hibiscus, and bird of paradise. Day Lilies, flowering evergreen shrubs, and bamboo are also all good choices. The sound of moving water can be very relaxing, and adding a water feature to your pool may be just the thing to bring your space to a new level. As an added bonus, moving water will prevent mosquitoes from breeding. Adding pool lighting is more than just a safety measure. Adequate and inviting lighting will allow you to enjoy your pool after dark. And don’t only add lights to the inside of your pool – consider how to add atmospheric lighting with outdoor solar powered lights or even yard torches. Fire pits or bowls can add atmospheric lighting too. Make use of fences, trees or shrubbery, or outdoor structures to define spaces and create a cozy atmosphere that will truly feel like a private retreat. 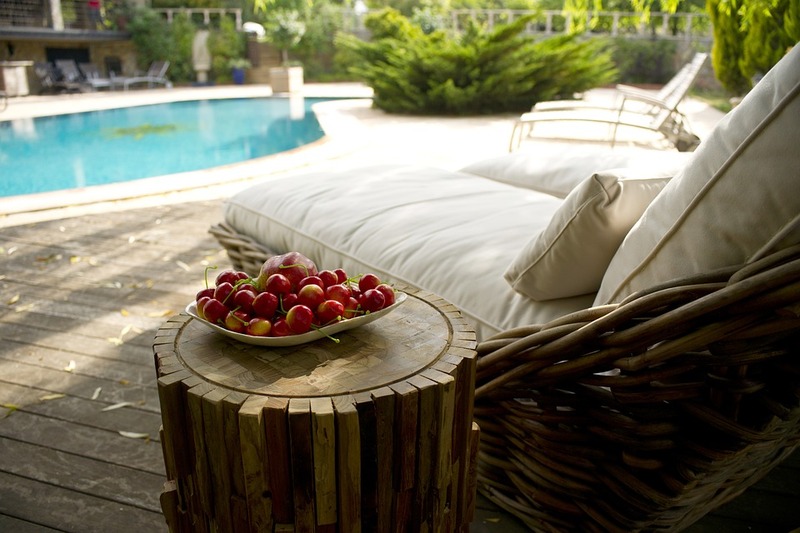 Pay as much care and attention to furnishing your outdoor space as you door your indoor ones. Choose comfortable padded furniture meant for outdoor use in a style that will complement the mood you are trying to convey. Having a favorite outdoor chair might make you more likely to simply sit by the pool and relax even if you don’t plan to swim. Decorative additions such as candles can add to the mood (and help to control pesky bugs). Store away unnecessary items, such as the kids pool accessories, in an attractive outdoor storage container – bonus if you can find one that acts as furniture too. Having a clutter free area will help you maintain a natural feel for that relaxing experience. The addition of an outdoor kitchen or bar will keep you from needing to make trips inside and out while entertaining guests, or even just having a family dinner. Don’t neglect to provide a shady area when you’d like to retreat from the sun. Trees, umbrellas, or awnings will give you the ability to enjoy the space while still being shielded from the elements.